A new kind of hero. The movie What the Health? has been blowing up lately. Even so far as pushing NFL left tackle Trent Williams to become a vegan. I haven’t yet seen the movie, but I do know that movies or other pieces of media show up like this here and there, only to have copious responses trying to debunk them and whatnot. I’m above all that, but when Trent Williams came out to say he cannot continue his vegan diet, I was ready to jump on it. It turns out that he was simply losing weight way to rapidly on the vegan diet. And while he respects that a lot of people want to lose weight, that doesn’t quite work when you are an NFL left tackle because he simply can’t spend the whole day trying to shovel down vegan food to maintain weight. So, he’s back to animal protein, but paying a lot more attention to what he eats. And you know what, who wouldn’t support that? Everyone should work hard to be knowledgeable about what they eat. And if you want to try some fad diets like veganism here and there, no one should fault you. But at the end of the day, it’s important to recognize that veganism is just a diet and hopefully one that is just a fad. 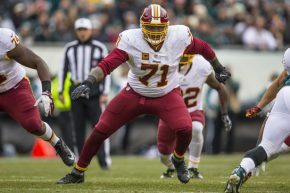 So, for pointing out that the vegan diet isn’t for everyone and embracing animal-based food back into your life, Trent Williams, you are a True Unvegan Hero!